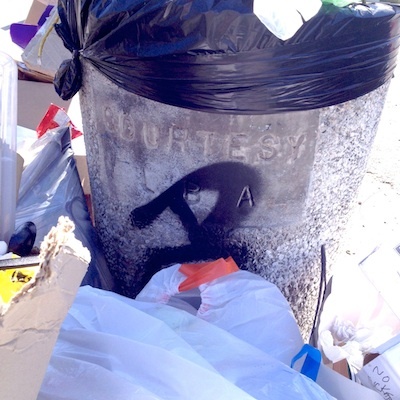 TRASH CAN on east side of upper Larchmont has become dumping ground. Life on upper Larchmont Blvd has been full of challenges the last two months. It feels like those of us who live and work north of Beverly inhabit the Forgotten Land, disenfranchised from the “Village.” I reference the trash can on the east side of Larchmont across from Page School, the ONLY trash can on that side of the street between Melrose and Beverly. It is heavily used, frequently to the point of over-flowing, and proudly labeled with “LBA” [Larchmont Boulevard Association]. Until recently, it was emptied on a regular basis, and then, without warning, trash pickup stopped. Neighbors began trying to figure out how to resolve the situation. We started with the LBA, since their name is on the can and the Page School said they had always dealt with them on this subject. I sent multiple emails to the [LBA] board, accompanied by pictures to show how bad the situation was. I left voice mails. No one provided any answers. SINCE TRASH pick up has ceased, neighbors, Councilman Ryu’s green team and others have pitched in to clean up. As it became obvious that we were on our own, neighbors began picking up trash and moving it to other receptacles. We contacted Councilman Ryu’s office for assistance. He provided us with immediate relief by sending a Green Team to clean up the sidewalk and empty the can. The team even covered up the graffiti. However, since it is not an official can of the city, regular pick-up could not be offered. We continued trying to contact the LBA to see about regular trash pick-up. We hoped that once the sidewalk was clean, regular pick-up would resume. Wrong. Even though we succeeded in keeping the sidewalk free of debris, two weeks later the can was overflowing again because it had not been emptied. One could see Salt and Straw containers, trash from Lemonade, bags from Louise’s—all legitimate debris from the local restaurants. Still nothing from the LBA, so once again we turned to Councilman Ryu for help. Once again he responded. Despite the neighbors’ attempts to solve a local problem, we are still suffering. We cannot get the can removed because it is bolted to the sidewalk. We cannot get the LBA to maintain it because they will not respond to our requests for help. We cannot get the city to pick up because it is not a city container. 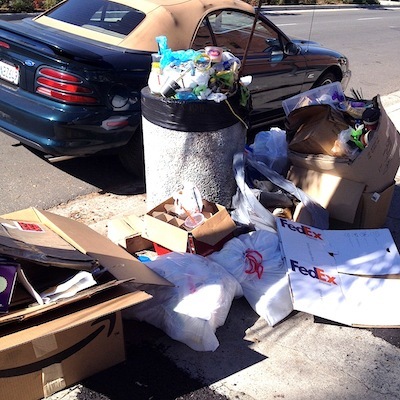 The time has come for the person who stopped the regular trash pick-up to get it resumed. North Larchmont does not deserve to be treated with such disrespect. We are your neighbors.